You missed the Rauh House tour but don't miss Oct 18, 11:30 am till 1 pm, The Inaugural USGBC Southwest Ohio Region luncheon to learn all about the USGBC and green building marketing! Oct 8, 10 till Noon, Rauh Residence, Southwest Ohio USGBC Green Home Tour,Woodlawn. Learn more. Oct 18, 11:30 am till 1 pm, Inaugural USGBC SW Region Luncheon, We have USGBC National’s VP of LEED v4 as our keynote!. Learn more. Oct 24, 1 - 4:30 pm, Green Associate Boot Camp, KZF, 700 Broadway St, Cincinnati, OH 45202. Learn more. Don't miss this rare opportunity to see one of the most famous modernist residences in Greater Cincinnati. It's on par with Frank Lloyd Wright's Fallingwater as a pristine example of a new style of architecture and includes a recreation of the original wild flower path landscaping plan. The tour is free to USGBC Chapter members (you can bring a guest). Non-members are asked to make a suggested donation of $15 per person. Contact Chair Chuck Lohre to register, 513-260-9025, chuck@lohre.com. You'll be given the address after you register. 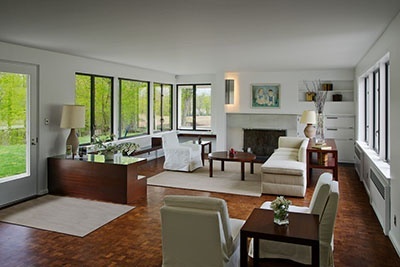 John Becker designed what is considered the first international style home in the region. Built in1938 and completely restored in 2013 by the Cincinnati Preservation Association to its original plan and upgraded with the latest energy efficiency methods including geo-thermal, added insulation and high performance glazing. 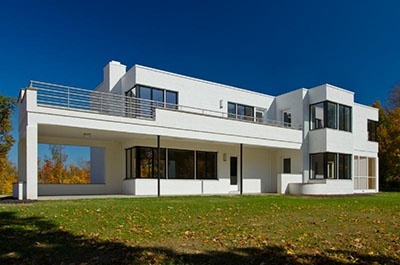 The Frederick and Harriet Rauh House in Woodlawn became the first Modernist residence in the state to be honored with a Preservation Merit Award by the Ohio Historic Preservation Office (OHPO). Awards were presented to Cincinnati Preservation (CPA), owner of the property; Emily Rauh Pulitzer, donor of the house; and architectural firm ArchitectsPlus. The Rauh House previously received a 2013 Residential Rehabilitation Award from Heritage Ohio in May and the restoration has been featured in local and national media. Learn more. Sustainable Partnership of Cincinnati, a group of businesses offering sustainable products and services to create sustainable homes and offices. Learn more at www.tspcincy.com.